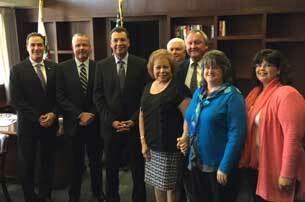 The CACEO committee, which was established to work directly with Secretary of State Alex Padilla, met with the Secretary in Los Angeles yesterday. The committee presented the Secretary with a packet of high-priority items highlighting critical election issues. The Clerk of the Board Legislative Committee is currently reviewing AB 169 by Assemblymember Brian Maienschein of San Diego, which would amend the California Public Records Act. Read additional details. CACEO voted to sponsor two bills at the New Law Conference for County Clerks, which have now been introduced into the Legislature as SB 799 (Committee on Business & Professions) and AB 630 (Linder). Following the Association's meeting with Secretary Padilla yesterday the "Voting Opportunities" committee was officially adopted. This joint committee will welcome membership from the Legislature and other groups as we work together to explore future California voting opportunities. If you would like to join please email Joe Holland, Santa Barbara. All three of our legislative committees are busy tracking bills that directly affect our daily operations. These diverse bills include AB 432 (Chang), which would allow electronic signatures in certain civil procedures (tracked by County Clerks), SB 414, which would replace references to a "husband" or "wife" with references to a "spouse" (tracked by County Clerks) and AB 971, which would require expenses to conduct certain vacancy elections to be paid by the state (tracked by Elections).